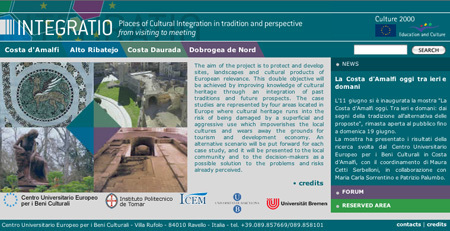 Design and implementation of the project website integrat, sponsored by CUEBC (European University Centre for Cultural Heritage) and Culture 2000, in collaboration with other institutional partners. Integrat The project aims to protect and enhance landscapes, territories and cultural products of European origin, this objective is met through the presentation and dissemination of knowledge about cultural history and traditions of four case studies, in all four geographical areas in Europe: the Amalfi Coast, Alto Ribatejo, Costa Daurada and the North Dobrogea. The site required careful planning, since each region is a space within the site, whose contents are then available in both English and native language of each area. For the collaborative nature of the project, the site provides forms of interaction between users and researchers and among researchers themselves, in the form of discussion forums, chats, and a reserved area dedicated to all those who participate actively in integrat. The site complies accessibility standards (second level, AA) and its contents are managed independently by the project staff through the use of ECOD publishing system.